So, I got the appetizer without the bleu cheese – it just isn’t my thing. The friend green tomato was hot and from the assembly of the dish, I knew I was in for a fine meal. The dish was remarkable. The salty bacon complemented the balsalmic drizzle and fresh ingredients below. The slightly crunchy fried green tomato topped the dish well. To be honest, I would have eaten this on a hamburger bun as my meal. But it’s restaurant week, so you splurge. The burger was the highest quality burger I’ve ever had. 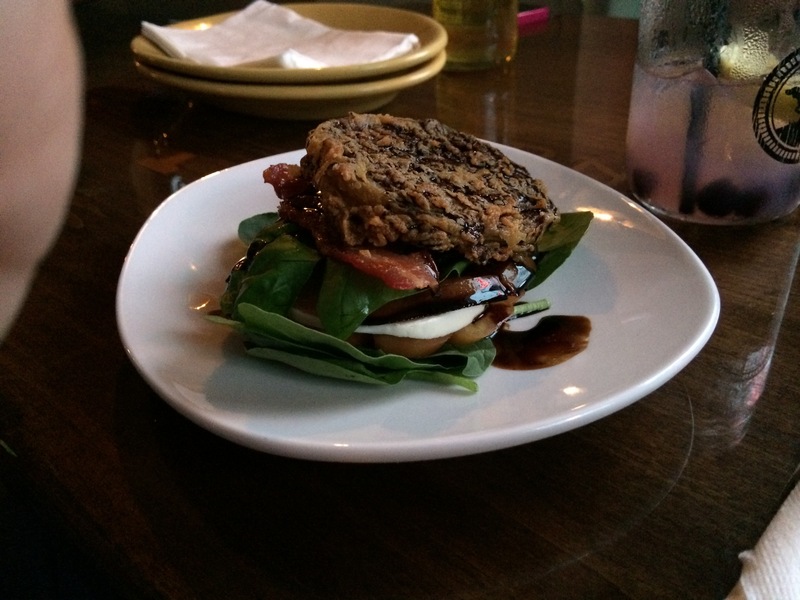 The burger was stuffed, as the menu listing indicated and cooked to absolute perfection. A steak knife was used to hold the masterpiece together. 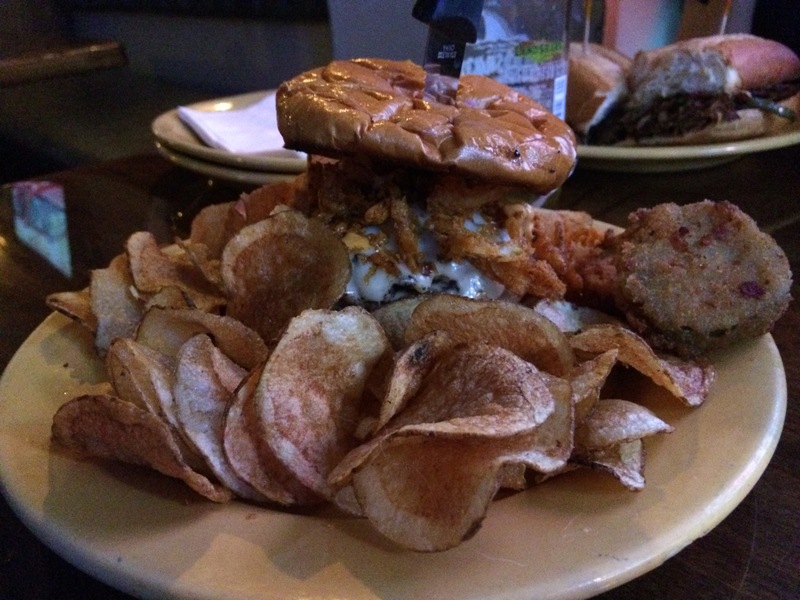 It was a little tough to get your entire mouth around the burger, so as you can see, the fried pickles came on the side. The burger was spicy, but not over the top. While I didn’t measure it, I bet the burger was a 1/3lb of meat. It held together remarkably well. The bun was soft and slightly toasted, I believe. The chips that came on the side were also delicious, but I left many of those on my plate and set forth to conquer this burger. Frankly, the burger was too good not to finish! After the burger, it was time for a break. We sipped our beverages and enjoyed conversation, asking the waitress to hold off on delivering the desserts for about 20 minutes. Ok, ok. This is where things got a little rough. The caramel sea salt gelato was great. It was creamy and a perfect mixture of salty and sweet. My first bite was heaven. However, I caught the buffalo seasoning on my second bite – that wasn’t so heavenly. 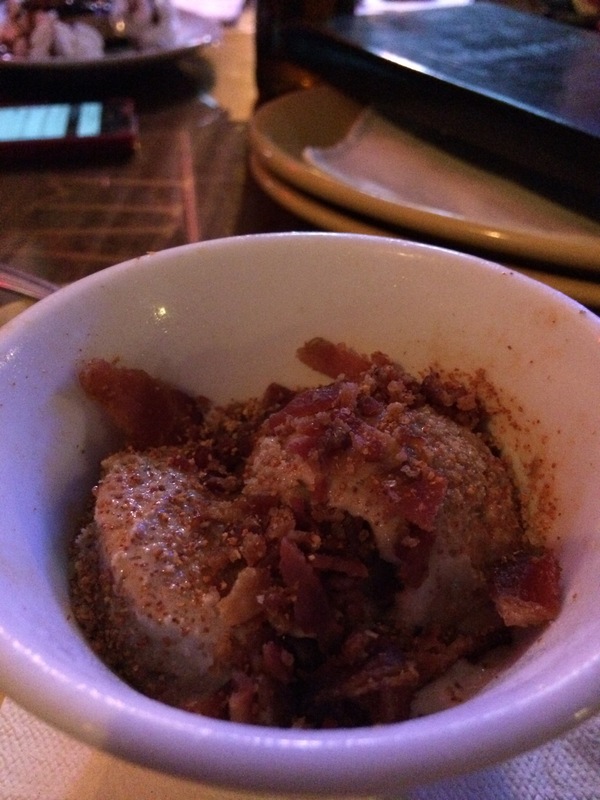 The entire table agreed, that we were on board with the gelato and even the smoky, salty bacon bits on top, but the buffalo seasoning was quite strong. We assume the seasoning they used was from one of the multitude of offerings on wing night (Wednesdays). Less seasoning may have been okay, but no seasoning would have probably been preferred. None of us finished the dessert – though we weren’t that hungry by that point anyway. I commend the chef for thinking outside the box and taking a risk. I would absolutely get it again without the buffalo seasoning. I suggest if you go there for Pittsburgh Restaurant Week, that you do the same.